Sure, it’s still blazing hot outside, but the school zone lights are blinking and the summer’s beach vacation is now but a fond memory, which can only mean one thing. Fall is just around the corner! There is something about changing seasons that begs for a little reorganization and decor update. Since Molly’s first Effortless Chic DIY was such a hit (you can see it here), we begged her to come back this week! This time she is bringing a little bit of interest and style to plain jane bookshelves everywhere. 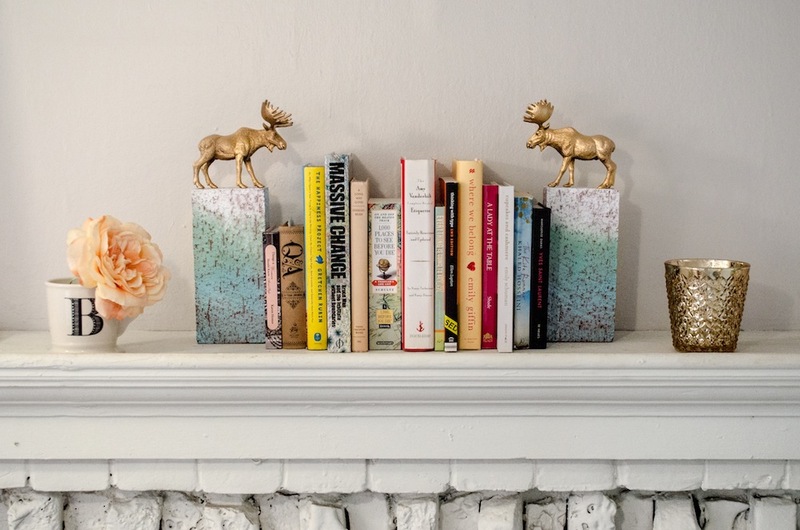 Or, in Blair’s case, to a chic little fireplace mantel display. Not to worry, the oceanic hued ombre of these new pieces will make it feel like summer all year round! 1. Spray paint the brick. 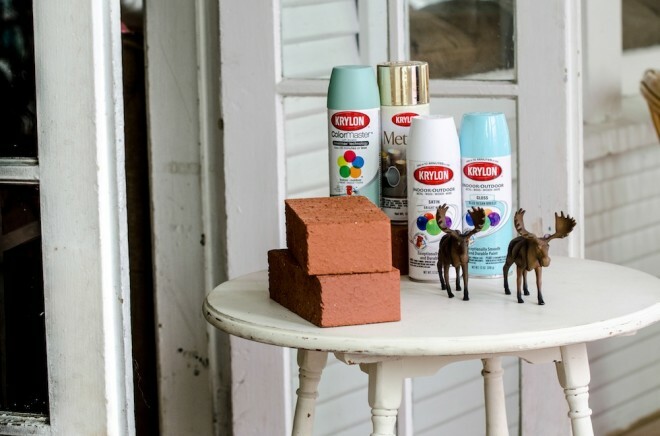 If you want to do an ombre effect on the brick start with the lightest color on the top and spray a little bit more than1/3 of the brick, next spray the next lightest color 1/3 of the brick and then the third. don’t worry about overlapping the paint a little bit, thats what gives it the cool effect. Make sure not to spray too close to prevent dripping. 2. 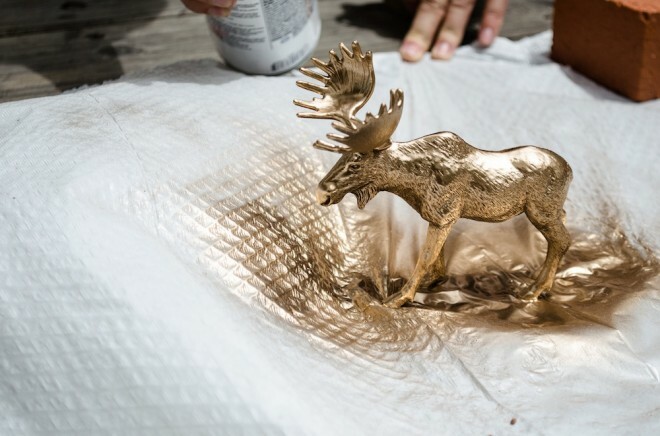 Spray paint the animal figurine gold. Again, make sure not to hold the can too close to the animal else it will drip! spray from all angles to make sure the bottom of the figurine is painted. Set it aside to dry. 3. Once both the brick and the figurine are dry (it will only take about 10 minutes), put small dots of hot glue on the bottom of the animal and glue to the top of the brick. We did our ends vertically but you could use the bricks horizontally too – depending on the size of the books/bookshelf! Fun idea, the difference in textures and colors makes them so interesting. Love this – I am all about using animals (specifically deer) to decorate, because they add an unexpected, fun vibe to the room. Definitely going to try this! 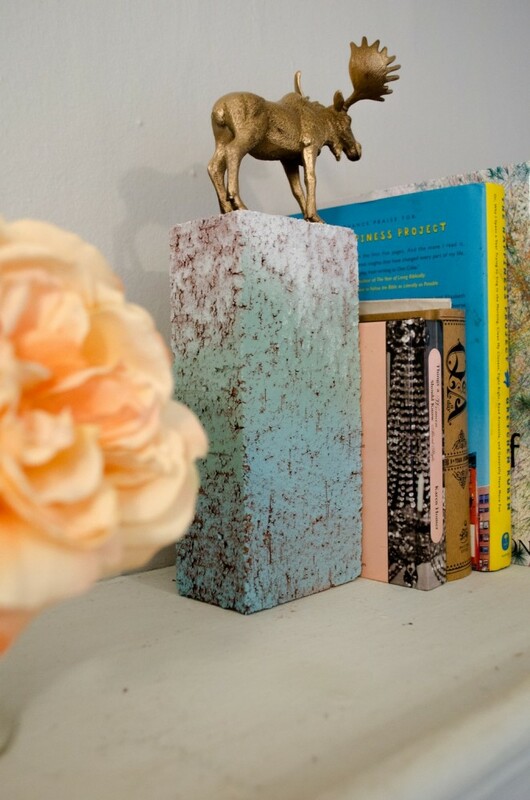 I totally find these awesome elephant figurines in a home consignment shop in Palm Springs, you better believe I spray painted those guys brass and use them as bookends and displays in my living room! That is amazing! I haven’t done a lot of shopping in Palm Springs, but I hear it’s amazing!